When load balancingPrinter load balancing automatically distributes print jobs between two or more printers. Load balancing is generally used to equally distribute print jobs across a pool of printers saving valuable time in document output for the user and at the same time balancing the wear and tear among printer devices. is used, jobs are distributed evenly between a number of queues based on intelligent algorithms taking into account several factors including printer load and error conditions. For more information, see Printer load balancing. Create a new print queueA print queue displays information about documents that are waiting to be printed, such as the printing status, document owner, and number of pages to print. You can use the print queue to view, pause, resume, restart, and cancel print jobs. on the print serverA print server is a system responsible for hosting print queues and sharing printer resources to desktops. Users submit print jobs to a print server rather then directly to the printer itself. A print server can be a dedicated server but on many networks this server also performs other tasks, such as file serving called Find-Me. You will configure this printer as a single global virtual queue that users will print to. It is called virtual as this print queue does not point to a physical printer and has no IP address. Point the virtual queue to a nul port, more help is available here. Ensure that the print queue has registered itself with PaperCut MF by checking the Printers tab of the Admin web interface. For more information about adding printers, see Add and remove/delete/ignore printers. This area determines which queues find-me-queue is capable of redirecting to. In Jobs may be redirected to these destination queues, select the print queues to which the find-me-queue can be redirected. In This device will display jobs for release from the selected source queues, select the virtual queue(s) you created for Find-Me printingFind-Me printing allows users to print to a single global print queue without selecting a printer, and then release the print job at any printer (via a Release Station).. 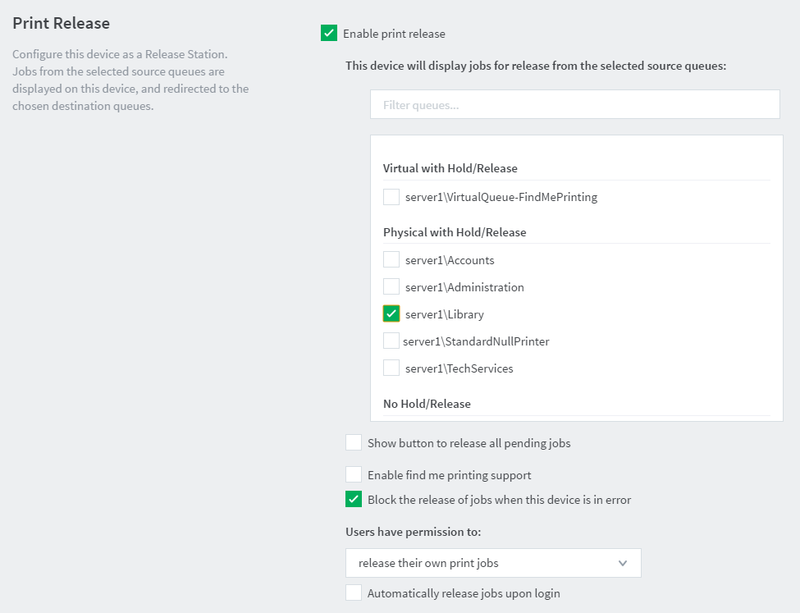 In Enable find me printing support > When released, jobs will be redirected to, select Multiple devices (load balancing). In the list of destination queues, select all of the physical print queues in the device pool.